Last year, I discovered Brian K Vaughan and Tony Harris’ brilliant Ex Machina series. Vaughan has become one of my top favorite writers of modern comics. In Ex Machina, he created a character named Mitchell Hundred. Alien machinery is embedded in Hundred's skull that allows him to listen and talk to any man-made machine: guns, cars, elevators, electric power grids, computers, etc. He has strange dreams which allow him to build devices like a jet pack, armor, and weapons. Hundred is aided by his friends, Bradbury and Kremlin, into becoming New York City's first superhero: The Great Machine. He then becomes the Mayor of New York City after preventing the destruction of one of the World Trade Center buildings. What I like the most about Vaughan is that he believes stories should have an ending. Y: The Last Man had a stunning and memorable conclusion after 60 issues, and Ex Machina 50 closes off the story of Mayor Hundred. It is difficult for me to become surprised at how stories unfold, but Vaughan ambushed me once again. Hundred has ambitions, you see. He wants to go further than simply being a mayor, he wants to enter Presidential politics. This has been mentioned throughout the series. 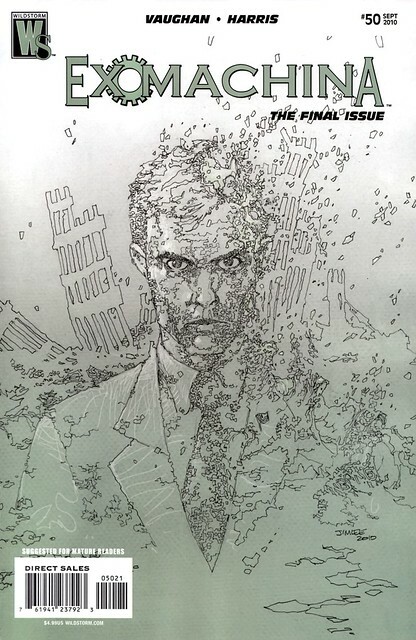 The first issue started off with Hundred in the future (our present day) ruminating about some dark and terrible things that he had done; we finally catch up to that moment in this final issue. I was fairly shocked after learning this secret. My reaction was one of total disgust and abandonment of this character I had grown to admire over the arc of the story. But that is also my reaction to most politicians that I admired, too. Jim Lee’s variant cover to the final issue isn’t something you would normally associate with the artist. It’s entirely appropriate to the story, the origins involving the 9/11 attack, and it even gives away an important moment on the right hand side: the word BANG. Nuff Said!